Spectators at a LARP? That is an absolute No-Go! At least in my circles, there is a strict rule: Everyone plays. Otherwise, the tackiness would hit levels that shouldn’t even be possible. I almost missed the punchline in the last panel, twere best done subtly. Like a burglar, even. Jeez Damien has some elven level cheekbones! Interesting, never realized Abbie dyes her hair. I’m happy to see that Mark and Dustin seem to be fine with each other. …Now I’m wondering how Ravenia reacted to Dustin leaving the Vampire LARP. Then again, Ravenia isn’t really the type to make a big deal out of it. She probably gets why he quit and decided to keep playing, just let it be. Like a reasonable adult. See, this is why I love Dustin. The pun is strong with this one. On the one hand, so far Damien seems like a rather chill person, certainly not the type Mark should have any reason to feel threatened by (though admittedly we have only seen him for a few panels). 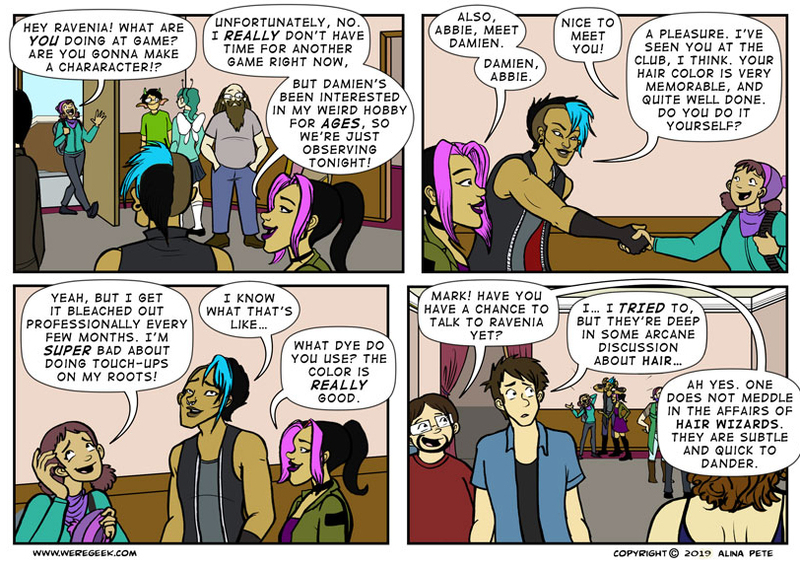 One the other hand, the fact that this is the very first time Mark and Damien meet and that immediately Damien and Ravenia are just going to hang out and watch Mark pretend to be a dog boy has disaster written all over it. In layman terms, this is kinda like meeting your ex’s new significant other at a kid’s party while dressed up as the Easter Bunny: if you’re not a very confident person, there is a high chance that you’re going to feel somewhat self-conscious. How is Abbie dying her hair a surprise to people? Do you think it’s naturally purplish? Anyway, as I’d suspected with Ravenia, Damien confirms that they’re not really “his crowd”. They seem perfectly nice, but it’s kinda fitting a square peg in a round hole. Seems a bit too much for the man who’d so recently led a sheltered live. Sorry this is a d*ck move by Ravenia. She is a larper so knows how it is NOT a spectators sport. She might not want to play but both her and lover boy get to be npcs or monster. I uphold the nobody watches the larp. Larp is a safe space after all where you can be another person. Spectators are going to giggle inappropriately. Abbie’s hair looks brown to me. TheDarkTyger because it looks light brown on a lot of computer screens, with a slight purplish shade but not enough to stand out unless it’s directly contrasted against brown. Huh, never seen larps allow spectators before. Even the few TV dokus About it I watched were done with everyone dressed up and at least attempting to participate. To all the folks saying “spectating” is weird, it’s not unheard of in really big campaign games. I used to “shadow” my roommate in her vampire campaign game from time to time. As long as you are respectful and stay out of the way it doesn’t have to be intrusive or disruptive to have spectators in a large game. I’ve seen plenty of LARPs that allow spectators. It’s a great why to spark interest and introduce new players who are unfamiliar with how LARPing works. “Quick to dander”. Made me smile, and laugh like hell inside. My husband used to do a lot of WhiteWolf LARPS back in his early 20s. I was his ride, but I was always to shy to join in. I’d sit in the OoC area, mostly reading a book or maybe watching parts that caught my attention. Occasionally I’d chat with another spouse of another player when he would come or any of the players when they were in the OoC area. The hell is with Damiens character design. He looks like he just fell out of Manly Men Doing Manly Things with that art style. To everyone saying “Damian is no Threat for Mark”. You really haven’t grasped polyamourous. Nobody is a threat to anybody unless they can’t stand each other. The thing is though, that Mark isn’t really someone who can deal with being part of a polyamourous relationship. At least not until he knows and likes the new guy. I know all that. I was talking from what I assume so far is the point of view of Mark, who clearly isn’t OK with the arrangement. At least in my experience, people who don’t handle polyamorous relationships well are people who see metamours as threats to their relationship with their partner, for one reason or another. Reasons may range from low self-esteem all the way to a paranoid desire to control every aspect of one’s life, but it is also pretty common in a society where monogamous relationships are expected. Thanks to some pretty unhealthy societal myths about interpersonal relationships in general and masculinity in particular, it is not uncommon for men to feel that they are competing with each other in every aspect of life, including relationships. In especially low self-esteem individuals, this may manifest as overtly confident and aggressive posturing to “establish dominance” as a way to preemptively try to protect themselves, a model of behavior that in reality only serves to antagonize the other party and make the posturing person seem unsafe to be around. Since we have yet to see Damien engage in such behavior (and since we already know Ravenia’s other partners aren’t like that at all), it’s safe to say that if Mark’s acting out because he fears for his relationship with Ravenia, it’s not based on anything that Damien has done so far. It’s all in his head, but it’s there because he’s still a newbie to alternative lifestyles. As we already know, Mark was a very average Joe until fairly recently (how many in-comic years has the story of Weregeek been going on, exactly? ), so it’s a safe bet that he’s still adjusting to all the counter-culture he’s been exposed to. He’s still unlearning all the ideas about “how the world works” that normie culture crams into people’s heads from an early age, and will still need time. The reason that Mark seems fine with Dustin being in a romantic relationship with Ravenia is that he knows him and trusts him. The key to forming a community is learning to extend a modicum of that trust to people one doesn’t know yet, i.e. not expecting the worst of people before one has had a chance to learn to know them. At least, that’s my theory until we finally learn what’s eating Mark. Hmmm I think it’s a bit weird how this is the first time Mark and Damien are in the same room together and yet Ravenia is focusing on introducing him more to Abbie than Mark, it’s a little off but this is an outsider looking in. Also the power dynamics seem to be all wrong, as in neither Mark nor Dustin, that we are aware of, have other partners Ravenia is the centre of at least their affection and the relationship seems to be focused on her solely rather than on multiple partner, maybe that is what is eating away at Mark in some way, I don’t know this is just an outsiders view looking in as I said before. I would love to go into a discussion or argument with you there…. but i can’t. The recent comic where he asks to talk to Abbie is a positive change though. Honestly I can’t remember another time where Mark was proactive about talking about something that’s bothering him, there may well have been one/some, but mostly I remember all the times when he didn’t communicate well… of which there were many!